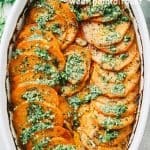 Sweet Potato Roast with Parsley Pesto – Tender, extra-flavorful roasted sweet potatoes with olive oil, a touch of butter, fragrant berbere spice, and topped with the most delicious parsley pesto. IF there’s one side dish that needs to seriously be at the center of your Holiday table, then, tah-daaaaahm! 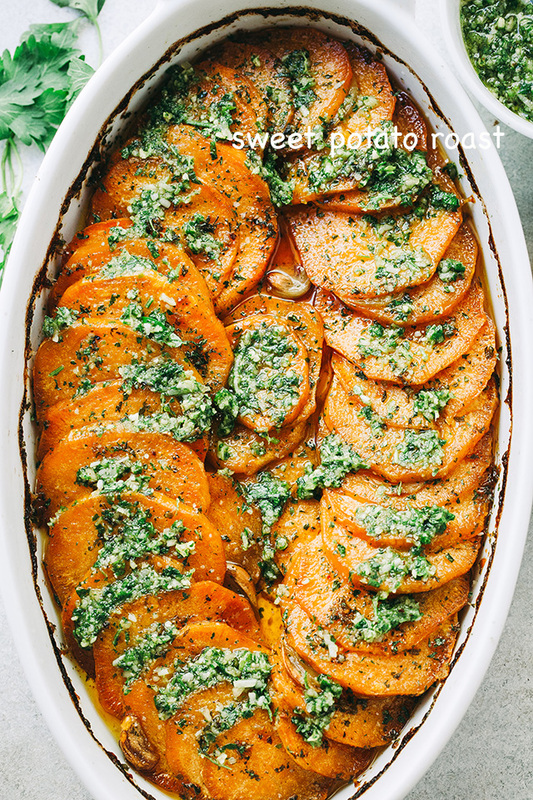 This Sweet Potato Roast with Parsley Pesto will be king! 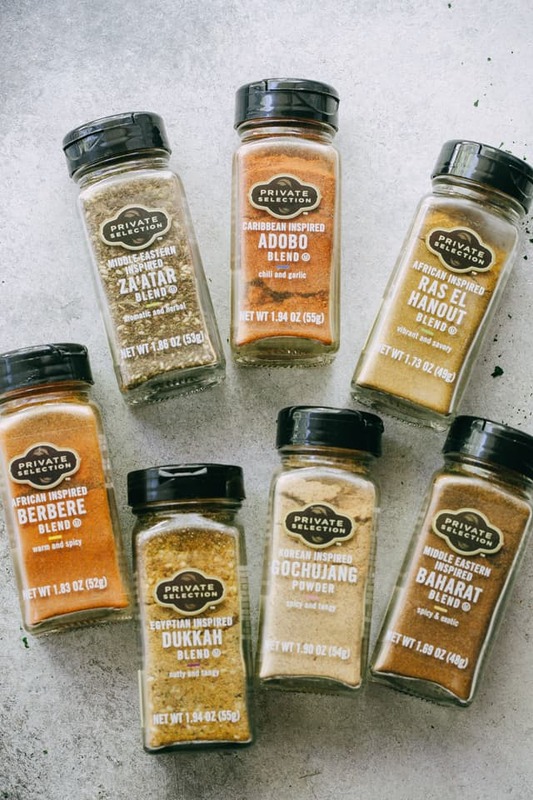 I’m so thrilled that today’s post is post is sponsored by my favorite spice makers and gourmet-food Gods, Private Selection. Virtual high-five to them and their exceptional palate. Okay, good! So, for those pork skewers, I used the Caribbean Inspired Adobo Blend and they were simply wonderful. Juicy and flavorful, could not stop at just one skewer. 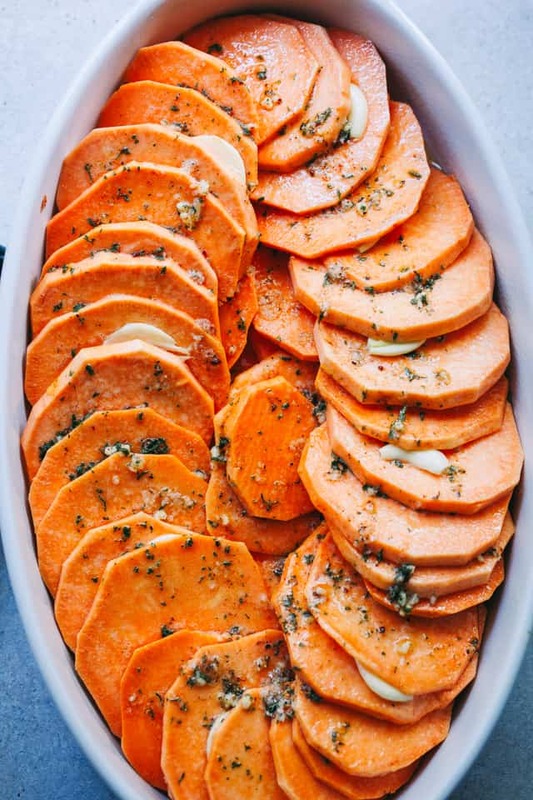 This time around, I really wanted to try something different, and I chose to make this Sweet Potato Roast with Private Selection’s African Inspired Berbere Blend. It is a dry powder spice mix of Ethiopian origin and can be easily used in any dish. 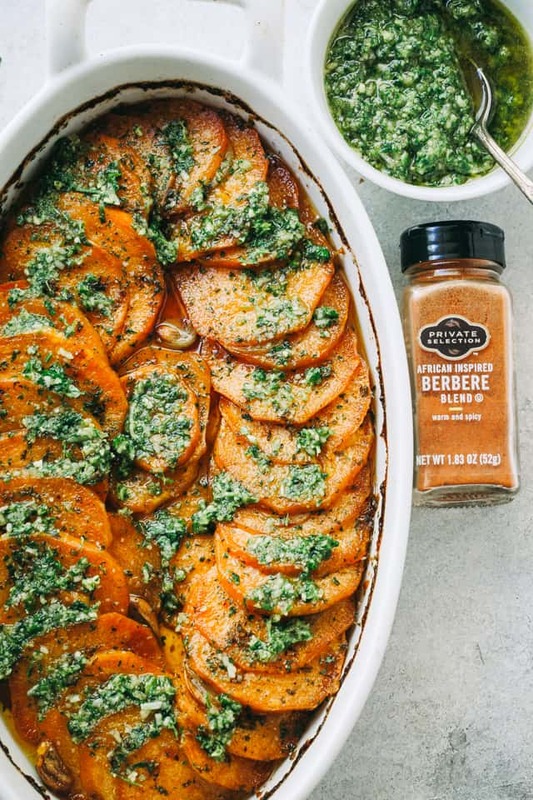 Potatoes side dishes are not always my thing, but I made these my thing by spicing them up with the berbere blend and adding parsley pesto on top… it’s incredible. The whole thing is just one big pile of amazing food. It has spicy, sweet, comfort food written all over it. And bonus! It is uniquely flavored and your guests will be raving about this to all their cousins and neighbors. Pinky swear. This recipe is fairly easy – just requires you to toss some sliced sweet potatoes with a delicious olive oil blend AND make your own parsley pesto. E-Z. Trust me. 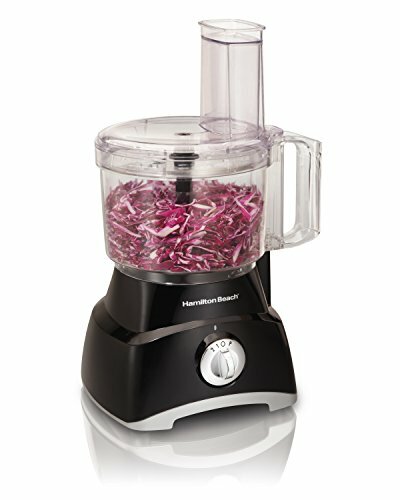 While the potatoes are roasting, you will combine the parsley, walnuts, parmesan cheese, garlic, olive oil, and berbere blend in a food processor. 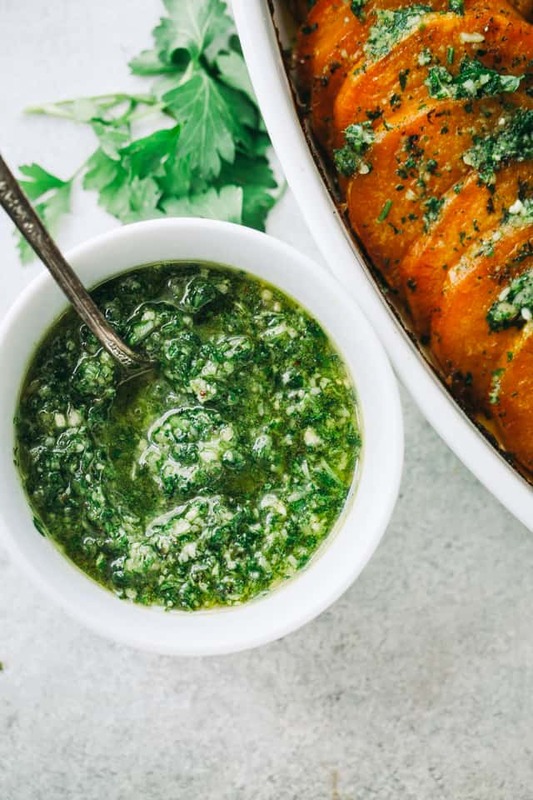 A blend or two later, you will end up with this gorgeous pesto that will accompany the even more beautiful sweet potato roast. Remember, Private Selection’s African Inspired Berbere Blend can be added directly to just about anything. Mix just a bit into prepared pasta sauce, or mix it directly into meatballs. Add a bit to ground beef when browning it for tacos. Use it as a spice rub for some baby back ribs, some steaks, or chicken. 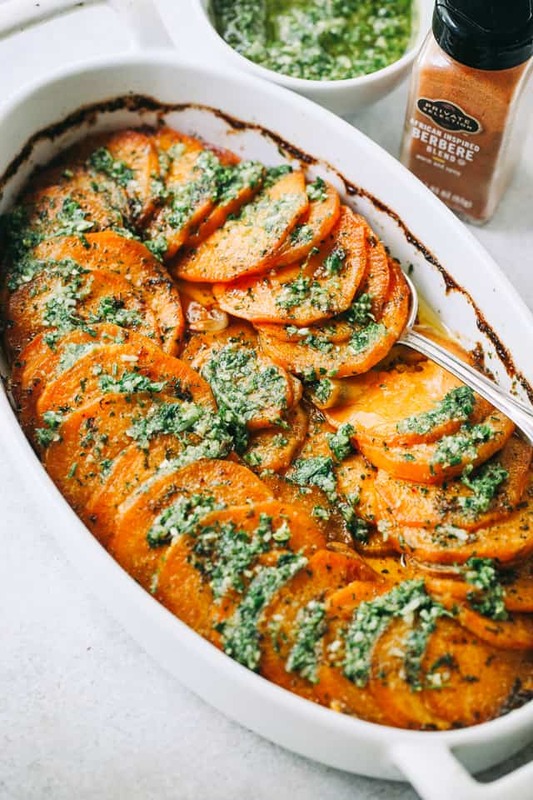 Tender, extra-flavorful roasted sweet potatoes with olive oil, a touch of butter, fragrant berbere spice, and topped with the most delicious parsley pesto. Combine olive oil, melted butter, garlic, berbere blend, salt, and pepper in a small mixing bowl; stir to combine. 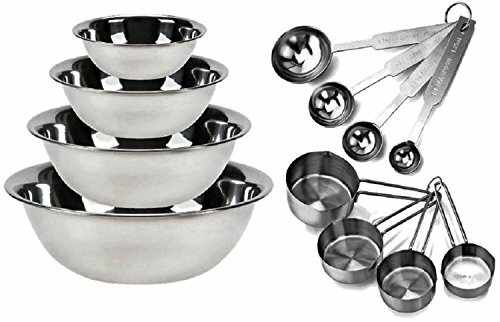 Pour 2 tablespoons of the mixture in the bottom of a 2-quart baking dish. Arrange sweet potato slices in the dish and brush potatoes with the remaining olive oil mixture. Remove foil and increase oven temperature to 450F. Roast potatoes for an additional 15 minutes, or until potatoes are slightly browned. 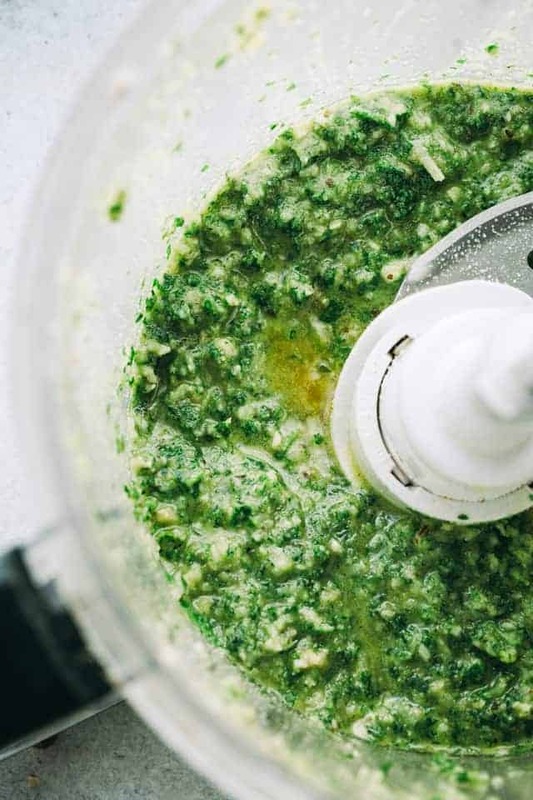 Combine parsley, walnuts, parmesan cheese, garlic, olive oil, berbere blend, salt, and pepper in a food processor; process until completely combined. 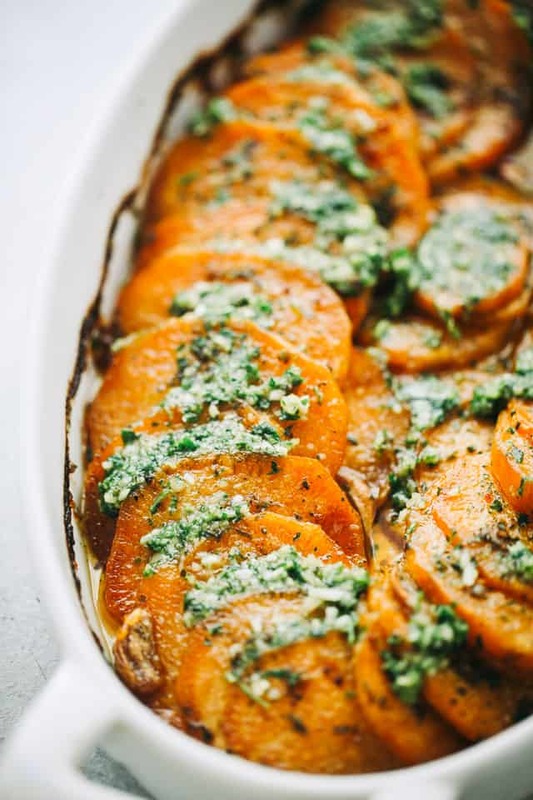 Brush the tops of the prepared sweet potatoes with the parsley pesto OR serve it on the side. Is there something similar to the berbere blend that I can substitute? Hi!! This is like an all in one spice – there’s ginger in it, paprika, chili powder, garlic powder, onion powder, and possibly salt and fenugreek. I hope that helps! 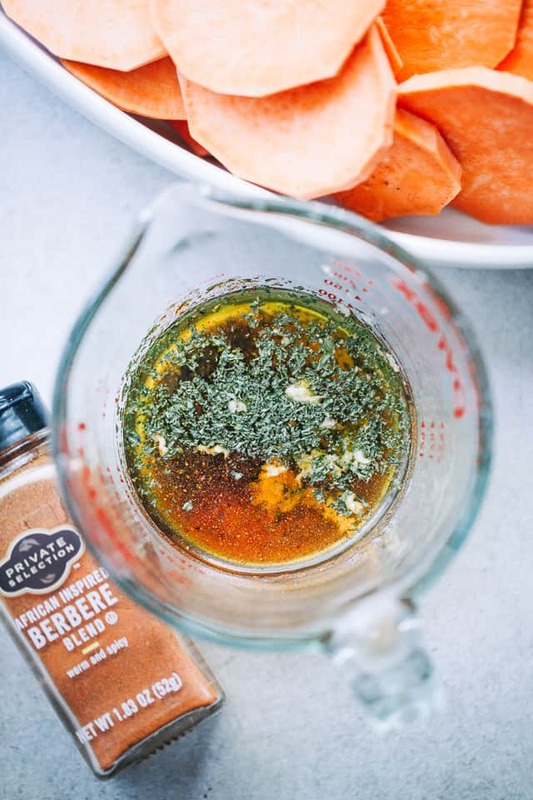 I already love sweet potato (much more than the other kind) so you had me there, but also love pesto and never thought to combine the two, so thank you for that and also for the Berbere blend spice, never used it or anything like it before, that I’m aware of! Hi Sabrina! It’s a delicious blend of paprika, chili powder, ginger, garlic powder, onion powder, etc… It’s so good!